Whether you’re experiencing uncomfortable symptoms from your varicose veins, or you just don’t like the way they look, at San Diego Varicose Vein Treatment Center, we will help you get rid of them. The good news is there’s a solution. Whether you’re experiencing uncomfortable symptoms from your varicose veins, or you just don’t like the way they look, at San Diego Varicose Vein Treatment Center in San Diego, we will help you get rid of them. Varicose veins are unlikely to be caused by crossing the legs or ankles. Less commonly, varicose veins can be due to other causes, such as post phlebitic obstruction or venous and arteriovenous malformations. 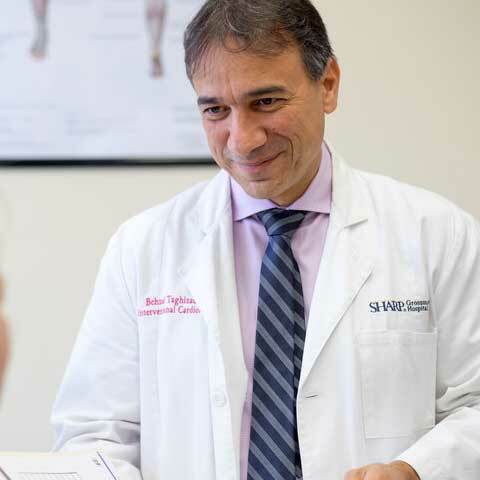 It’s important to know that all procedures are medically approved and have been used by hundreds of thousands of patients to relieve the pain and suffering caused by varicose veins. Dr. Behzad Taghizadeh will not only diagnose your varicose veins but also perform medical procedures to remove or close them. These minimally invasive procedures will eliminate the diseased veins, allowing the blood flow to redirect to healthier ones. When you come to us for the diagnosis and treatment of your varicose veins, you get the peace of mind that comes from knowing you’re in good hands. Interventional Cardiologist, Dr. Behzad Taghizadeh is highly specialized in varicose vein treatment with over 15 years of experience managing complex peripheral vascular and venous diseases. He uses the latest in FDA-approved procedures. What Vein Treatment is Right for You? Learn more about varicose veins and spider veins FDA-approved treatments, causes, symptoms, and risk factors.